Nordfab Quick-Fit Bleed-in Valves are used to adjust air flow to balance systems by introducing ambient air. 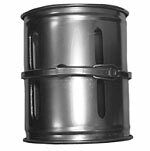 Now available in Galvanized, Aluminum, Stainless, and Stainless+ with optional no. 4 finish. Seam: longitudinal seam is solid laser welded for strength and to reduce leakage. Collars: located on the exterior side of each port and considered as air flow non-directional. Collars have a laser welded longitudinal seam (exception: 3" collars are lapped, spot welded, and caulked.) If air flow directional product is required, it must be stated on the PO and additional cost may be incurred. 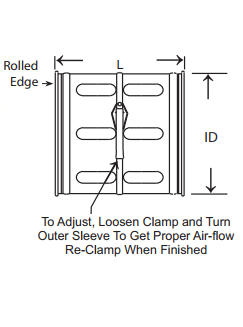 A raised lap seam and spot weld are used for attaching the collar to the body and no caulking is used. If caulking is required, additional cost may be incurred.